In recently-released statistics, the American Society for Aesthetic Plastic Surgery noted that blepharoplasty, commonly known as eyelid surgery, is one of the most frequently performed cosmetic surgeries in the country. Many people opt for blepharoplasty because their upper eyelids are sagging. In extreme cases, this can even hinder the patient’s vision. Upper eyelid surgery to de-hood those eyes! Hooded eyelids can be specifically addressed with upper eyelid surgery. This type of procedure is best suited for individuals with significant amounts of loose, sagging skin in their upper eyelids. Generally, a tiny incision following the natural contours in the crease of the upper eyelid is made. The incision makes it possible for Dr. Kearney to remove or re-drape excess skin. Fat may be repositioned or removed, and underlying muscles are usually tightened, too. A standard upper eyelid surgery takes less than 60 minutes to perform. The majority of patients who undergo upper eyelid surgery also need a forehead/brow lift. This has to do with the proximity of the brows and the upper eyelids. 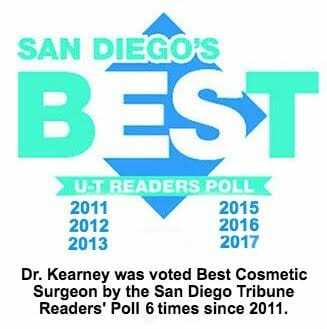 A thorough physical assessment and a discussion of your cosmetic goals with Dr. Kearney will help figure out whether or not you need a brow lift with your blepharoplasty. It is best to perform both procedures at the same time so that you can limit your recovery time. Healing following eyelid surgery varies from one patient to another. For some, any swelling and vision issues pass within a couple weeks. But for others, it can take a few months for all the swelling and related issues to completely run their course. If your eyelids are hanging low, call us and let’s talk blepharoplasty, 800-671-1951 or 858-677-9352.